I have been slacking on tracking my natural dyeing and since I spent most of March preparing to teach my first indigo dyeing class at Rebelle, this seemed like the perfect opportunity to start again. My past experiences with indigo have been with the dry powder in a chemical vat, but a few months ago I discovered Jacquard's Pre-Reduced Indigo which you can buy alone or in the tie dye kit that includes the reducing agent. I'd never used the pre-reduced indigo, but I read that it is faster and more user-friendly than the more traditional forms which made it a great fit for the shop. The other unique thing about indigo is the dyeing technique used. 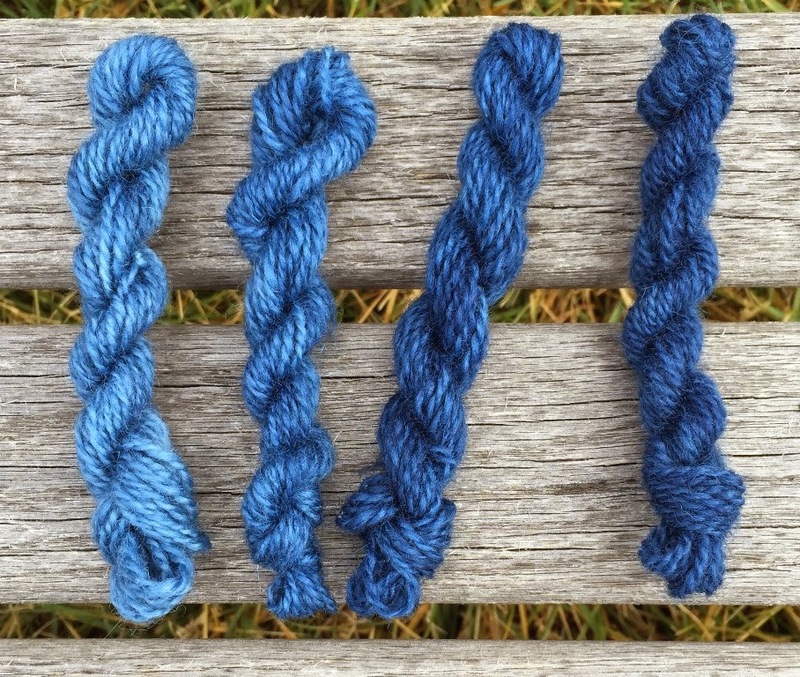 Protein and cellulose fibers are dyed the same, there is no modant needed, and the actual time the fiber spends in the dye is short compared to other dye methods. To dye, the peice is carefully submerged into the vat and stays there from 1-5 minutes. Then it is carefully removed from the vat and comes out a bright green (called indigo white.) After 20 or so minutes outside the vat, the oxygen in the air turns the indigo white to blue. Darker blues are achieved with multiple dips in the dye. 1,2,3,&4 dips in the indigo vat. The first time I teach anything is always a bit of a mess so two weeks before the class, my friend Chris and I tested the class setup I had planned so I could make alterations before the actual class. This was also a chance for me to do some actual dyeing since I rarely get to do anything during class time other than teach. 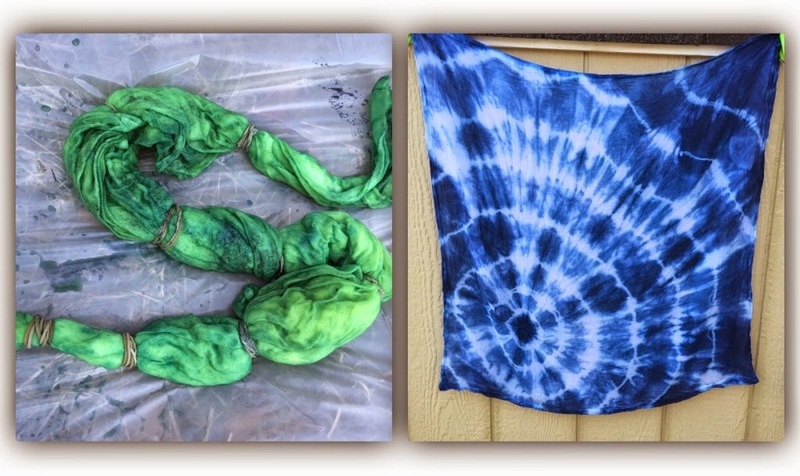 I dyed some yarn, some roving and a few shibori tea towels. After we solved the set-up issues I made the final shopping list for the class and I was ready to go. 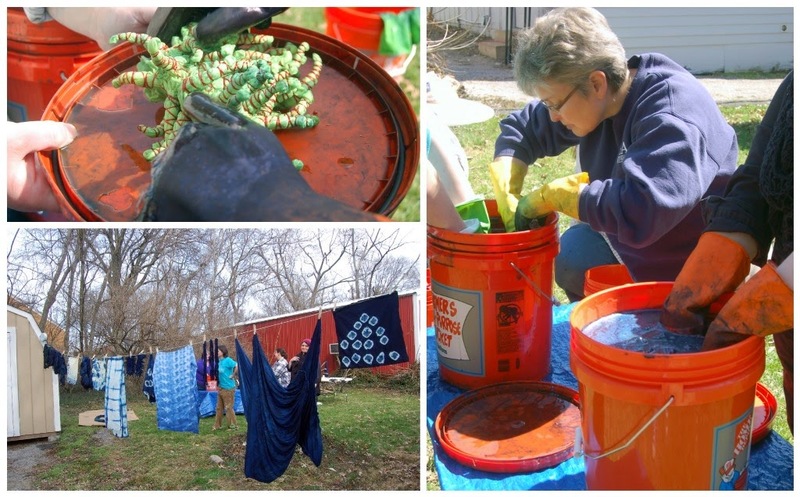 The class set-up consisted of two vats, a flat oxidizing area and a clothesline for oxidizing the larger peices of fabric and skeins of yarn. I used 5-gallon buckets from Home Depot for the vats which can be bought with a tight-fitting lid for under $5 and are absolutely perfect for a vat you want to re-use. Next adventure- growing indigo in the dirty south.